Learn how to draw a puppy! 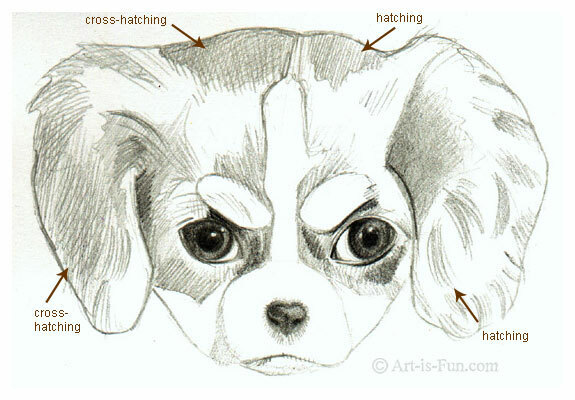 I'll show you how to draw a mischievously cute Cavalier King Charles Spaniel. 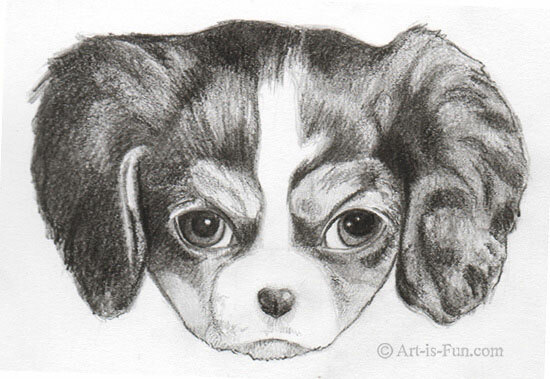 This drawing lesson explains the drawing techniques that I used to create this cute puppy drawing. 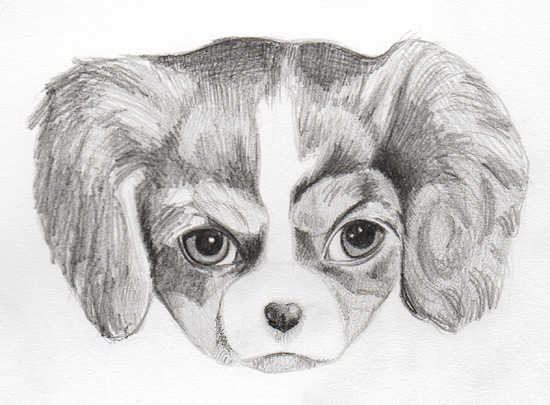 For this puppy drawing, I used a set of General's Kimberly Drawing Pencils (this links to Blick Art Materials, and if you make a purchase I get a small commission that helps support this site). The set that I used contained 10 pencils, ranging from very soft to very hard. This is a great range to have for doing drawings. The particular pencil drawing set that I used had pencils ranging from 8B (very soft) to 4H (very hard). The set of 10 also included a handy eraser and a sharpener. Please note that you don't have to use all of the pencils in a set when you learn how to draw a puppy. I probably only used 4 of the different pencils in this puppy drawing. 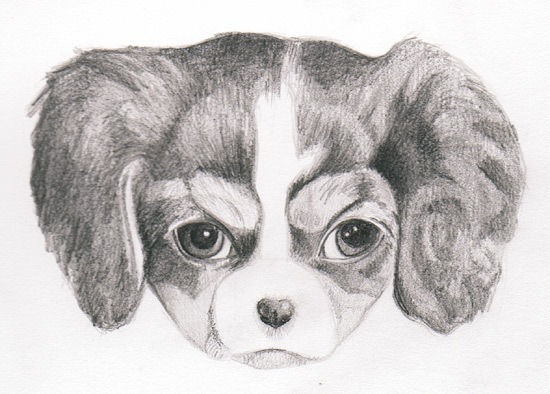 Here is the cute puppy that I used a model for my drawing. Doesn't she look a bit cheeky? I really wanted to capture that mischievous glimmer in her eye. This gorgeous puppy belongs to Jelene, who gave her permission for me to use her puppy photo as a reference for teaching you how to draw a puppy! Cute little thing, isn't she? I decided to focus on just the head of this darling dog for my drawing. 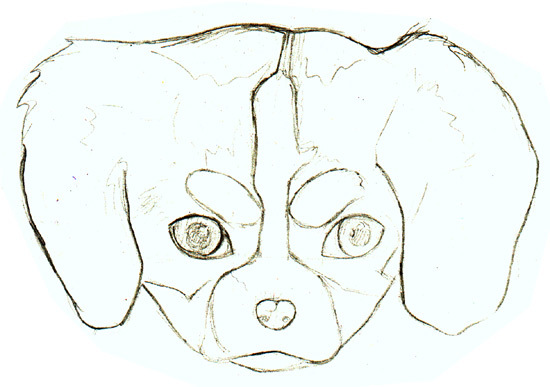 I started by drawing the outline of the puppy, as well as her main features. I also drew light pencil marks to indicate the areas of lighter and darker color. To draw the outline, I used a very hard 4H pencil. The harder the pencil, the lighter the line will be. At this stage, you want to draw everything in very lightly, so that you can easily erase mistakes and adjust proportions. When drawing a puppy, I start with the eyes. I make sure that they are proportionate to one another. Then I draw the nose, again checking that everything is in the right place. WIth the eyes and nose in place, it's now easier to lightly draw the outline of the head, the ears and the mouth. I would advise only using a 6B pencil when you are really ready to make something look dark though, because if you press hard, the 6B pencil marks will be hard to erase if you make a mistake! Next I start lightly shading in the other areas that will be dark. I start off lightly, using soft, light pencil strokes in a combination of hatching and cross-hatching. As you can see, at this stage I work fairly quickly. I don't worry about perfection. My main goal is to just get down an idea of where the dark and light patches are. Sometimes when we work on a drawing, we get frustrated or discouraged if the drawing doesn't look how we want it to look right away. Don't worry about this! Drawing is a process, and it takes time. Most artworks look weird when they're "in progress". This is normal, and everything will fall into place the more you work on the drawing. When doing hatching, I generally try to make my lines go in the direction of the fur. I use a pencil that is slighter softer than the pencil I used previously, resulting in a darker line. So after using a 2H pencil, for example, I then use an HB pencil to help make the shading even darker. In the picture above you can see how I go in with an even softer pencil to draw even darker lines. Compare the left side with the right side to see the difference. The right side is all 2H, and the left side is HB on top of 2H. I also adjusted the shape of the inside of the eyes, because they were too small. Now I've done the right side with the HB pencil and the puppy drawing is really starting to take shape. She is beginning to look 3-dimensional! Remember to draw your lines in the direction of the fur. Although sometimes, for darker areas, it is effective to cross-hatch in opposite directions than the fur. Now I use a very soft 6B pencil to make very dark marks. Rather than hatching or cross-hatching, in which the pencil is lifted after each stroke, I now use a smooth back-and-forth motion. And here she is, the finished puppy drawing! I think I managed to capture that adorably naughty expression. What do you think? 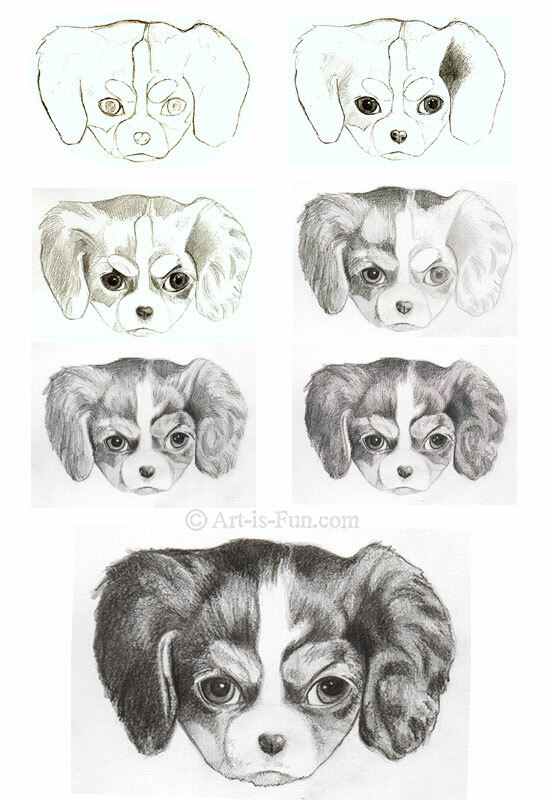 Now that you know the basics steps for how to draw a puppy, you can practice making lots of puppy drawings! Please note that at this point your puppy drawing can get easily smudged. (You may have even noticed this while you were working on it!) If you'd like to protect your puppy drawing for longevity, spray it with a final sealant that prevent smudging and fading. Sealants also ensure protection against UV rays and moisture. The sealant that I use for my drawings is called Krylon Crystal Clear. If you need an easier lesson on drawing dogs, click here to learn how to draw a dog in a fun cartoon style. Check out the Drawing Lessons page for more fun drawing art lessons!